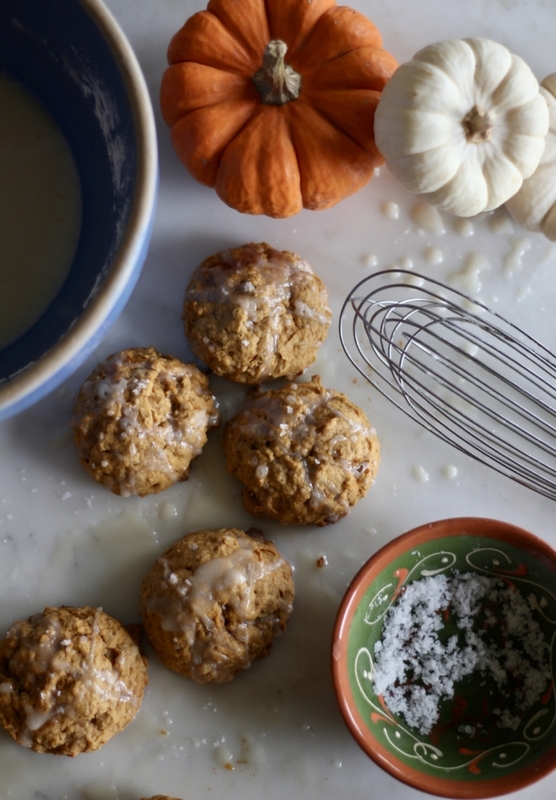 Spiced Pumpkin Oatmeal Cookies with a Maple Sea Salt Glaze — Newport Sea Salt Co. I realize I bake during times of stress and lately I am baking a lot. it is a good thing that it is fall time as we need to get our winter ‘coats’ on. ;) The news is a constant reminder of ‘ugh’ in our world…I can’t believe I used ‘ugh” as an adjective?! When I feel overwhelmed by life’s woes, I love to bake and take pictures and just find the pretty. So with that being said, I woke up super early on a rainy Saturday morning that I could have slept in and decided to get out a few baking bowls and a can of pumpkin. While the coffee maker percolated our Custom House coffee blend, I quickly got started and soon had the scent of fall in the air before all my boys woke up. I come from the school of thought that cookies should be part of every meal….breakfast cookies, why not? Life is short, enjoy the moment. These cookies will ensure you have enough energy to play soccer in the rain, grab some seafood at a Seafood festival, and take in a pumpkin patch! Sprinkle Newport Sea Salt 100% pure sea salt to finish on top of the Maple Syrup Glaze. 1. Heat the oven to 350°F and arrange the racks to divide the oven into thirds. Line 2 baking sheets with parchment paper; set aside. 2. Whisk the flour, oats, baking powder, cinnamon, ginger, salt, and nutmeg in a medium bowl to aerate and break up any lumps; set aside. 3. Place the butter and sugars in the bowl of a stand mixer fitted with a paddle attachment and beat on medium speed until lightened in color and fluffy, about 5 minutes. Stop the mixer and scrape down the paddle and the sides of the bowl with a rubber spatula. 4. Add the egg and vanilla, return the mixer to medium speed, and beat until incorporated, about 30 seconds. Stop the mixer and scrape down the paddle and the sides of the bowl. 5. With the mixer on low speed, add half of the reserved flour mixture and mix until just incorporated. Add half of the pumpkin and mix until just incorporated. Repeat with the remaining flour mixture and pumpkin. 6. Drop 8 dough rounds per baking sheet by the scant 1/4 cup, staggering them 2 inches apart on the prepared sheets. 7. Place both sheets in the oven and bake for 12 minutes. Rotate the pans from top to bottom and front to back and continue baking until the cookies are golden brown on the bottom and around the edges, about 12 minutes more. 8. Place the baking sheets on wire racks and let the cookies cool on the sheets for 3 minutes. Using a flat spatula, transfer the cookies to the wire racks to cool completely. Let the baking sheets cool to room temperature and then repeat with the remaining dough (you can use the same parchment paper). When all of the cookies are baked, set the pieces of parchment paper aside. 2. Place all of the cooled cookies on the reserved parchment sheets. Dip a fork into the glaze and drizzle it over the cookies in a zigzag pattern. Sprinkle with Newport Sea Salt 100% pure sea salt and let the cookies sit at room temperature until the glaze has set, about 20 minutes.